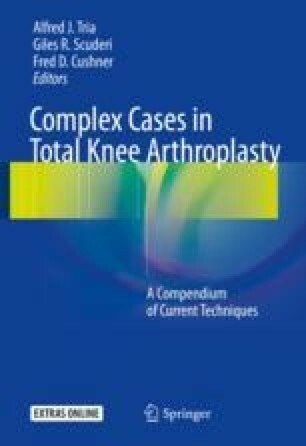 Total knee arthroplasty has become a very common procedure over the last decade. Patients are being treated earlier, and the severe deformities seen in previous decade are encountered less frequently. Despite this, there are occasions where the patient presents with a significant fixed deformity. A stepwise approach is required to safely deal with these severe deformities. Failure to do so may lead to skin compromise and further complicate the surgery. Once the arthrotomy is performed, in a stepwise fashion, tight structures need to be released to enable good surgical exposure. Quadriceps snip and an early lateral release are two techniques that can improve exposure. The bone cuts are also important, and often additional distal bone is resected to allow for full extension. A post-capsule release is also often required to enable achievement of full extension. Caution is needed, and patients need to be counseled when there is a severe flexion contracture as well as valgus deformity, since this deformity can be associated with a postoperative foot drop. Kim SH, Lim JW, Jung HJ, Lee HJ. Influence of soft tissue balancing and distal femoral resection on flexion contracture in navigated total knee arthroplasty. Knee Surg Sports Traumatol Arthrosc. 2016. https://doi.org/10.1007/s00167-016-4269-9. Epub ahead of print.